"That we can often see Venus and Mercury throughout the year. I was always unsure about it before and now I know where to look." The progression of historical astronomy. Trying to see the logic of outdated concepts is intriguing." "How eclipses are dependent on the timing and orbiting of the moon. I was always curious why not every full moon is a lunar eclipse, and not every new moon is a solar eclipse. I knew the answer had something to do with the path of the moon, but I didn't know for sure." "How you can view the solar eclipses using a pinhole in a card. I always knew looking at the sun whether there is an eclipse or not can damage your eyes, but how to look at eclipses safely seems very interesting to try it out." "How something so small like the moon could completely cover something as big as the sun simply because of distance and perspective." "Eclipses, because of their historical context. People used to understand them in different ways, usually with religious significance. Some people might still revere them in this way, but it is interesting when compared to our modern understanding." "I have always believed a lunar eclipse was caused by the sun blocking the moon. I'm not sure where this belief came from or why I never questioned it because sitting here thinking about it now that makes no sense. Learning that they are actually caused by the moon moving through the shadow of Earth was really cool and seems logical." "I found the story of Copernicus very interesting, mostly this is the first time I am learning of this man. including is that Aristotle's philosophy was so valued that it became part of some religions, via the most perfect region was in the heavens and the most imperfect was in the Earth's core which went with common belief of the locations of Heaven and Hell." "Right now it is very hard to differentiate between all of the astronomers, just because there is so much information about all of them. But it is something that I will continue to work on, and they should be easier to tell apart in the future. Something confusing from the presentation slides is were it talks about the timing between the moon phase and slowly changing moon orbit, how the timing between these two cycles determines whether or not there is a solar or lunar eclipse during a new or full moon. I get confused of how to tell when it has the right or wrong phase and wrong or right orbit." "That the moon turns a coppery color during a lunar eclipse was strange. How is it that Earth's shadow could cause the moon to change color like that?" "Umbra and penumbra. Maybe it was because they're kind of funny words :), but I was also confused about if you're standing in the penumbra, what you would see, and the same with umbra." "The apparent retrograde motion of planets. I just want a little more info. I understand I think." "It's hard to believe that astrology is accurate, when I now know that precession changes the alignment of the sun and the constellations. Maybe if horoscopes didn't solely depend on birth month and also accounted for the birth year, then astrology would be more reliable. Discussions in class previously have made me not believe that it has any merit in predicting futures Well I just learned from last class that my astrology sign is not really my sign. So now in learning this new information, I feel now that I disagree about the issue. I guess now that I am learning the actual truth about astrology and how it works It has changed my neutral perspective. I don't believe it to predict my personal future but may predict eclipses and season changes." "Again I don't know how the alignment of things might influence your life. Maybe the seasonal changes and solar energy might have an affect, but I don't see how everyone born in the same month or so would lead the same lives." "Same reasons as before. The sign is simply based on what constellation the sun happened the be in front of. How does that have anything to do with predicting one's future?" "I don't exactly agree it predicts my future because its been wrong several times. But i think the personality traits that are part of the different signs is accurate. I'm a scorpio and it accurately describes me." "I stand by my statement as that I do believe in astrology but not enough to live by it, life is ran by chances, nothing is set." "My belief hasn't changed. I still don't believe the placement of stars can predict at any accuracy things from my future. My belief is held firmly in God." "Maybe a little clarification on partial/total eclipses and their different effects on total solar eclipse versus annual solar eclipses." "I like the use of videos/animations in the class. Being able to see how things move along with different patterns and paths of other things is helpful." "I know we have the reading of the chapters, but I am worried about the exams and quizzes. Where is there a study guide, and also where can I get help on this class, because this is tough for me to wrap around my head. I've tried to go to the student center but they have no tutors on this subject. I just want to pass this class and get some help while I'm at it." Students have a weekly online pre-lab assignment (hosted by SurveyMonkey.com), where they answer questions based on reading their textbook, material covered in previous lectures, opinion questions, and/or asking (anonymous) questions or making (anonymous) comments. Full credit is given for completing the pre-lab reading assignment before next week's lecture, regardless if whether their answers are correct/incorrect. Selected results/questions/comments are addressed by the instructor at the start of the following lecture. The following questions were asked on "defending the model" of vehicle mileage versus weight. G = –0.0043·m + 60. "For a 2017 Ford Focus, when I plugged in the weight of the car (2,935 lbs) I got a gas mileage of 47 miles per gallon. The actual average gas mileage is 30 mpg city, and 40 mpg freeway. So I would say this model does not produce reasonable results for light cars." "No, it predicts that a car not weighing a single pound will still have a mpg of 60." 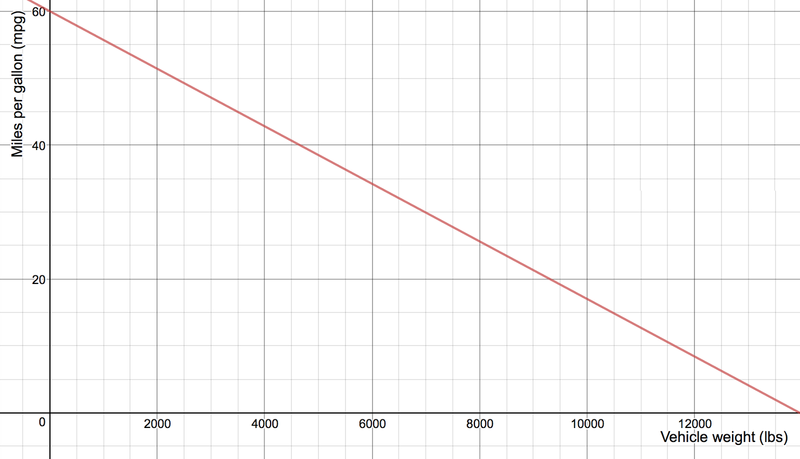 "The graph does make sense and predict reasonable results for small independent variables. A lighter car is imagined to have a higher mpg, but as the data approaches zero there is a minimum weight of a vehicle produced so the data should not go much lower than around 1,800 lbs." "For a large vehicle the data really does not make sense. Let's say our vehicle was 16,000 pounds, according to this data our gas mileage would be negative which is not possible." "The model does represent large variables well, up until the weight exceeds 14,000 lbs, because all vehicles get more than 0 mpg." "For a 2017 Chevy Silverado, when I plugged in the weight (4,510 lbs) into the equation I got 40 miles per gallon. The actual mpg is 18 city and 24 mpg freeway. Given that I would say this model does not produce reasonable results for heavy cars." "This model will not work for large vehicles like semi-trucks that can weigh close to 80,000 pounds. For a standard car this model would work." "At the initial point (0 lbs, 60 mpg) the data says a car can have a weight of zero. That is not the case. The trend is not unreasonable from 2,000 to 12,000 lbs but it needs some kind of leveling off. 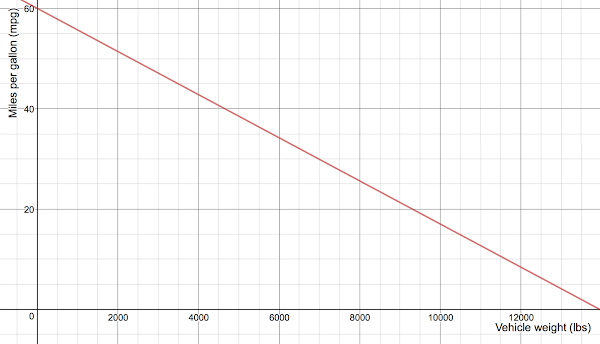 I would recommend a best-fit polynomial with this data." "While the graph implies strictly that greater weight means less fuel efficiency, this is not the case. A 1,100 lb Fiat gets 32 mpg highway, and a 2,800 lb Corolla will get 40 mpg highway (both non-hybrid models)." "Yes, as long the car as we test are within the same boundaries and characteristics the small sample is data was collected from we should be able to use this mathematical model." "That light will travel through a polarizer that has the same orientation as the waves of light. If a polarizer has a vertical orientation, vertical waves (or vertical components of waves) will pass through while horizontal waves will not." "The total internal reflection (TIR) flowchart is a visual concept that I was able to grasp quickly. You can determine if Snell's law fails (or not); or you can calculate the critical angle θc for the first medium (n1) when θ2 in the second medium (n2) has a 90° angle. If θc is less than θ1 we can say that there is TIR, but if θc is greater than θ1, then there will be transmission and reflection." "Polarized light is not polarized when you are looking directly at it, but when looking after it has been side-scattered it is polarized in some way." "I better understand the concept of polarization now with the help of some practice. It still takes a while for me to process and visualize it in specific problems." "Vertical antennas must have vertical receiving antennas. Horizontal antennas must have horizontal receiving antennas. Any light parallel to a polarizer will pass through, but anything perpendicular will be blocked." "The part that did make sense to me was the section of the transverse waves. The waves or the oscillations of the rope can go in any direction, and those waves that have been created have a similarity to that of the polarization of the transverse waves." "For best reception, the orientations of the source antenna and receiving antenna should match. Malus' law determines the intensity of light passing through a polirozation based on angle of the incidence light vs transmission axis of the polarizer." "There are polarizers to prevent differently polarized light from going through. 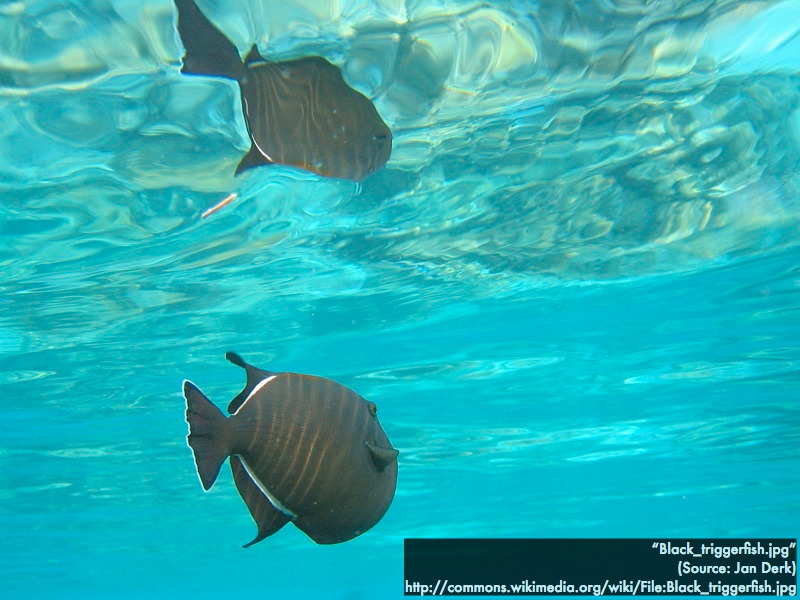 The amount of light that gets through depends on the angle that the polarizer is at." 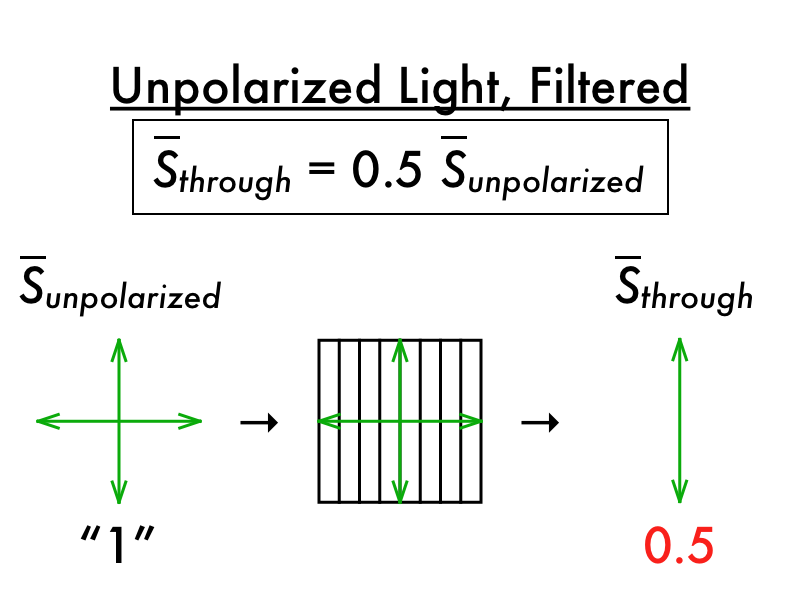 "Polarized light will only pass through if it is parallel to its filter. Perpendicular light will not be able to pass through a filter." "The drawings we did in class with the compass of how the radio waves with certain transverse polarizations that go N-S or E-W, etc.. When we did the in class worksheet it started to make more sense but that only was because I was able to talk it out and visualize out loud." "Trying to find the vertical/horizontal polarizations of the filters in front of the display screens, it's just a little hard to mentally picture it." "I need much more help on polarized and unpolarized light in regards to dipole antennae transmissions and polarization by scattering. I think that if I did more problems it would help me understand much better." 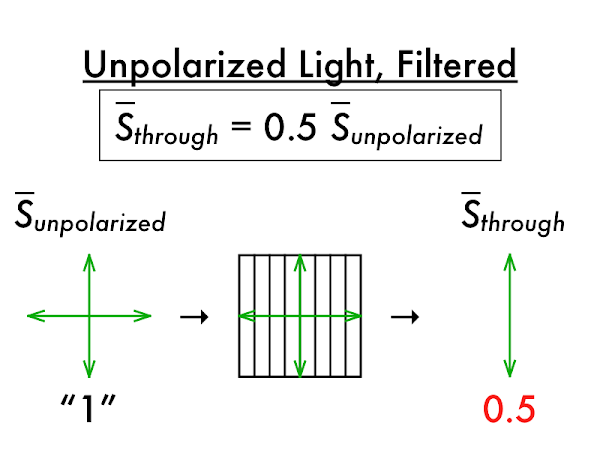 "How horizontal and vertical polarized light is generated." "Malus' law. I would like to go over an example of it in class because I only kind of understood it from the textbook and the blog." ""An example on when the transmission axis of the polarizer is on an arbitrary angle with respect to the polarization of the incident light would be helpful." "An example on when the transmission axis of the polarizer is on an arbitrary angle with respect to the polarization of the incident light would be helpful." The following questions were asked on reading textbook chapters and previewing presentations on total internal reflection and polarization. "In the case where the incident angle θ1 in the higher refractive index material n1 is greater than the critical angle value θc, there will be no ray transmitted out into the lower refractive index material. The ray will instead be reflected back down into the higher refractive index material n1, subject to the law of reflection." "Vertically polarized radio waves are forms of light that transmit electronic waves. These waves oscillate like a rope being vibrated up and down. Antennae are parallel to one another in order to send receive the perpendicular waves. Polarizer filters are similar in the sense that they receive parallel waves but block perpendicular ones." "How optical fibers work! It was very cool how it uses frustrated refraction by snells law to transmit light waves for long distances with minimal energy loss." "That there are two required conditions to make total internal reflection possible. I also find it interesting that diamonds can be cut to reflect light many times, simply by the angles they are cut, but rhinestones have to have a reflective coating on the back to produce the same results." "How Snell's Law plays into the three different incident angle cases for possible total internal reflection." "I'm totally lost with all the horizontal, vertical, parallel and perpendicular antenna stuff going on." "I am a little confused as to what the difference between unpolarized light and polarized light is. Is it because there is not one specific starting point of the light that makes it unpolarized?" Total internal reflection is possible when a light ray in a __________ medium hits a boundary with a __________ medium. A vertical antenna will emit __________ polarized light. Horizontally polarized light can be received by a _________ antenna. "One thing that I found interesting was how the celestial north pole appears to be near different stars depending on the era, because of precession of Earth over time. This was personally interesting for me because prior to learning this I thought that the star near the celestial north pole remained the same over time." ""From the textbook: 'Australians see many constellations and asterisms invisible from North America, but they never see the Big Dipper.' As a child finding the Big Dipper was my expertise, to think if I was raised in Australia that I'd never find the Big Dipper blows my mind, I now wonder which asterism I'd be obsessed with today if I was raised there." "I am really excited to learn the terminology for such beautiful moments as when I see a planet in the dawn or evening sky. I never new we called them 'evening stars' and 'morning stars.' Also the Zodiac and its alignment with our calendar months." "I found the concept of precession to be the most interesting because it impressed on me the idea that we are studying something infinitely vast from such a limited relative perspective. There is so much more going on than we are able to perceive." "A concept that I found interesting from the reading was about an asterism: a named grouping of stars that is not one of the recognized constellations. The example the book provided was the Big Dipper and that it is really part of the constellation Ursa Major. This is particularly interesting to me because I had never known that. I thought the Big Dipper was the name of it as a constellation, and yet it is just a part of a bigger piece of the sky. Also, I had no idea that the word 'zodiac' meant." "Tilt. I found this interesting because I didn't know that in the winter the sun was lower in the sky and in the summer the sun was higher in the sky." "Seasons are super-interesting! I did not they are caused by the amount of solar energy that Earth's northern and southern hemisphere receive." "Though I've always been fascinated by the moon, its orbit and phases were beyond me. Aside from knowing the basics--waning, waxing, full, new--learning about what causes the moon to appear full and not as full was extremely interesting. I also found it interesting that the reason we see the same face of the moon all the time is caused by the tidal coupling between Earth and the moon." "I thought the way the presentation was set up was very interesting. I think I like it more than just sitting in a boring classroom taking notes." "I was slightly confused about Earth's axis taking 26,000 years for one cycle. I can visualize it, but for some reason it doesn't fully make sense." "The difference between rotation and revolution. I think I've got it down but I can't confidently say I could distinguish the two." "The use of the starwheel." "I found the cycle of seasons to be a little confusing. I never knew that earth actually tilted which is what causes the seasons." "When trying to guess the names of the moons I was a little confused. Which one was waxing and which one was waning, or crescent, or gibbous. New moon and full moon I get; just other ones took me a minute to get the order of how the terminator moves across the moon." "I believe astrology was originally used long ago when Ancient people did not know much about the world and they used the position of the stars to make predictions about their fate and future. However, now that we have a more accurate scientific understanding of the world, I believe we can say with certainty that the position of the stars have absolutely nothing to do with our future." "The notion that the position of the stars, relative to Earth, has any hand in determining a person's life, is ridiculous." "It's fun to read but I don't know of any studies or proof to validate any of the claims." "The ancients had far less material distractions in their lives than we do now. I don't think it is unreasonable to assume that they may have had a sharper sense of personality and character traits etc. than we now do." "I believe that there can be links between astrology and predictions, but I believe it has to do more with human behavior rather than what may or may not happen to you in the near or far future." "I've always loved astrology, so I am biased, but it seems reliable." "Homework is based off of the knowledge one collects on their own, as a conventional class homework is review." "It seems like the consumption of content is done at home and practice is done in the classrooms, instead of vice versa." "Homework is done before coming to class so students can formulate questions and maximize class discussion time." "In a flipped class students have access to instructor videos/lectures ahead of time to free up in class one-on-one time between instructor and students for a more hands on learning approach vs. sitting through a lecture without any engagement." "Homework in a flipped class is more important because you are teaching yourself the topics. If you go to class without doing the homework it will probably be extremely hard to understand and participate in class. In a conventional class homework isn't nearly as important in the learning process." "Most of the learning is done on your own, outside of the class, so you can take full advantage of the teacher going around and helping individuals during class time. Whereas, in a conventional class, the learning is done in class, while work is done outside of class." "Most of the learning should occur when you are in class. By asking questions that you have and by doing things"
"In the classroom because you're working with your peers." "The student learning occurs outside of the classroom, knowing what is to be expected for the next lesson. But on the other hand, the student is able to learn more inside the classroom with improved teacher assistance since a concept has initially been taught before class. " "'For the love of God read the textbook!' This one hit me like a ton of bricks because I am a serial skimmer/not reader and it's such a bad way to approach classes. I needed to see this as a (not so) gentle reminder to get it together and just do the reading." "'DO ALL THE READING ASSIGNMENTS.' I feel like I have to agree with this one. It's in all caps which makes me think this kid didn't do all the reading assignments and fell behind because of it. OR this person did do all the reading assignments and knows how important it is to your grade. Either way I should probably just do the reading assignments." "'Keep up with the readings and assignments and don't skip class.' I agree with this person because if you skip class its like not doing your homework and if you don't do the readings and assignments then you might as well just drop the class cause you won't learn anything." "'To be patient with the course. You may feel like you are not doing good at first and that the class is really hard, but with time you get used to the layout and the points add up quickly.' I feel that this quote not only sums up how everyone should approach your class, but how everyone should approach life in general. It makes no sense to stress yourself out over things that will probably work out in the end. Didn't you leave UC Davis for just that reason?" "'Relax and have fun don't overstudy, don't overestimate the difficulty of this course. Read read read!! Do your online homework and go to class. Take thorough notes!!!' I agree with it because from past experiences when you're overstressed it's hard to focus, which is why you need to relax and try to enjoy the information you're learning about. If you think the class is going to be difficult then it will be, but if you try to enjoy it then it'll come to you. Notes and homework are always a key so you can go back and look them over to study." "'Love the subject you're learning about, have a curious mind, and ask questions when you don't get it. (You have an awesome instructor and helpful group members around you to help you out!)' I picked this piece of advice because it's the advice that stood out the most to me! Sometimes, I need to be reminded to have a curious mind and I am stubborn about asking for help. I'm hoping that I will be able to love this subject, always stay curious, and be willing to ask questions when I don't understand." "'Yo, this isn't astrology, so get that out of your head.' I definitely had a chuckle with that one." "I'm super-excited to see how the flipped classroom format works and how effective it is, I've never been enrolled in a class with this format." "That zodiac being an 'arc of animals,' because I never knew that and am very into reading horoscopes and learning about my sign (Gemini)." "Tilt and revolution, as in how explains why seasons are hot/cold. Summer is when the sun is high in the sky, and winter is when the sun is low in the sky. Tilt determines this when the northern hemisphere is facing towards the sun making it warmer, which in turn means summer. And when the northern hemisphere is facing away from the sun, it is colder, meaning winter. It's neat seeing how our seasons come in to play with how Earth is interracting with the sun. I would like to know how fall and spring come into play as well, though." "The 'wobbly top' analogy helped me visualize the concept of precession pretty well." "You started class by telling us how insignificant we actually are in the universe. In reading the textbook and looking at the illustrations of us, then Earth, then the universe, it became more clear to me what you meant. Seeing how tiny we actually are in the great scheme of things was crazy; a real eye opener." "That even when it's daytime, there are still stars in the sky. Up until this point, I had assumed that stars only came out at nighttime. I found it interesting that we can't see them when it's daylight because of the glare and reflection from the sun." "That the eastward rotation of Earth makes it seem like the sky is traveling westward!" "Earth's tilt and how the seasons change because of it. It makes sense to me that the tilt causes the changes in temperature but it was confusing how the arc of the sun played into it. Higher and lower arcs across the sky didn't make sense." "The phases of the moon--in particular how to distiguish wheather the moon is a first or third quarter. How do you tell if it's getter bigger or smaller?" "I disagree because, there are lots of people in this world. how can some stars tell everyone in the world there future, when all of us are unique in our own way." "I think that the idea of astrology is almost like Greek or Roman gods; interesting, imaginative, and thought-provoking. It's good story material, in my opinion." "Why would everybody born in the same month have the same lives?" "I honestly don't know what to believe. I have read some astrology and sometimes it seems as though it is on point in describing personality traits and predictions. And other times I feel it is just a general and fun description of traits that can be applied to anyone. I am really not sure how I feel about it other than I like to read them." "I feel that the universe is attuned to everything. my belief in it isn't extreme, but I feel a little off when Mercury is in retrograde." "Well so far its been accurate, but I do not strongly believe it, more as to just get a better read on someone." "I have an open mind when it comes to astrology. I think it is interesting how accurate the predictions are sometimes. Other times it is way off and I have a feeling that that's because I am human and make my own decisions :)"
"I believe that astrology can make pretty accurate predictions about your future and your personality. But the way that 'professionals' offer astrology predictions is so vague that it could apply to anyone." "I have a strong belief when it comes to the characteristics of the zodiac signs. My personality is is accurately described under a Scorpio's description." "I like flipped class because I can go over all the information you would be teaching us, but actually dissect it myself to see what I understand and don't understand, and therefore know what questions to ask you before we move on to clarify what I'm truely confused on. Versus in a regular class you'd teach us what we need to know and we'd do our homework to test how well we know it, then just move on to the next chapter." "The homework gets you prepared to do in class activities/discussions, and lets you prepare questions, or things you need to clarify in class." "In a flipped class you do your homework before class so you can ask constructive questions in class. having done the reading and work before hand you will know what you dont understand." "Instead of having information dumped on you, and then being sent home to work on the problems yourself, you are expected to read and prepare before hand. Homework is made easier; you have time to read the information and prepare questions, which you can then come into class and ask, which makes going home and doing additional work easier." "I don't know but it feels a bit easier to understand then just straight up reading from a book and mentally copy-and-paste the material onto a quiz or test." "I can go over all the information you would be teaching us, but actually dissect it myself to see what I understand and don't understand, and therefore know what questions to ask you before we move on to clarify what I'm truely confused on. Versus in a regular class you'd teach us what we need to know and we'd do our homework to test how well we know it, then just move on to the next chapter." "The difference is that all students learn at a different pace as others. Therefore flipped classes let you see the next week's lecture and get familiarized with the concepts." "Most student learning should occur at the student's individual pace." "Before class, so when some things don't make sense we can go over that or seen time on activities to apply what we learned." "In a conventional class, most of the learning is done in class when the teacher gives some sort of lecture. The most student learning for a flipped class occurs outside of class as homework, so that the teacher can help clarify things during class." "It depends on the kind of learner you are. I personally will learn more through reading/watching the lectures/videos, and having my questions clarified in class. With flipped learning, in class the attention is focused on the teacher, and some students may absorb more information with the more 'personalized' relationship. Most of the teaching is "self-didactic", or occurs within ones own understanding/reading of the material." "I'm not sure what a flipped class and conventional class is." "Most student learning should take place at home, so discussion and application can happen in class." "Most learning would occur in the classroom where you can focus on the stuff you didn't understand. It's more personalized this way." "Most learning will happen on your own before lecture, then you can fine tune your notes with questions in class." "Most learning occurs away from class in a traditional setting, where in a flipped class, most learning occurs in class. The reason I say this is, I am a hands-on learner, and through the flipped format, class time is free for hands-on application." "'Do homework and study past tests before the midterm.' By studying past homework and test material, I can get an idea of what information will be required and important." "'Do all the reading assignments and keep up with the reading.' I agree with this because as you mentioned, this is a flip class. What we read is what we learn, and the more we read and stay up to par, the more successful we will be in the class. Even though you give us broad overview of our lesson, class is more meant to engage what we took in over our own readings at home." "'Show up to class.' Even though this a flipped class, I still believe that invaluable information is dispelled in class, information I may not get online. Attending class also means that I engage with other students, and we can exchange ideas and help each other." "'Ask questions.' I agree with this. Even though it is currently out of my comfort zone to do so, and I am currently feeling intimidated by thinking every question I have to ask is going to be a dumb one! I currently am embracing the new change and remaining optimistic that this may actually help me and I just may learn a thing or two about astronomy." "This is the first online homework assignment and attempt of really understanding how your flipped class approach works. I feel like this week I am personally trying to not overthink this and just go with the flow and see what happens." "This class seems like it's gonna be one hell of a ride and I can't wait." "I'm having a hard time following the phases of the moon. Looking at a picture how do you decide if the moon is waxing or waning? What are some tricks to remember the moon phases?" "Under the radio towers on Capitol Hill"
FM radio station KCBX broadcasts at 90.1 MHz, while AM radio station KVEC broadcasts at 920 kHz[*]. Radio signals from station __________ have a longer wavelength in air. Wave speed v depends on the properties of the medium. Frequency f depends on the properties of the source. These two parameters can be varied independently of each other. where v1 = v2 (as both waves travel through air). Because KCBX (here, station 1) has a much higher frequency than KVEC (here, station 2), then f1 > f2, and thus λ1 < λ2, and so KVEC broadcasts radio waves with the longer wavelength. The following questions were asked on reading textbook chapters and previewing presentations on electromagnetic waves and redirecting light (reflection and refraction), along with advice from students from the previous semester, and videos on the flipped class mode of instruction used in this course. 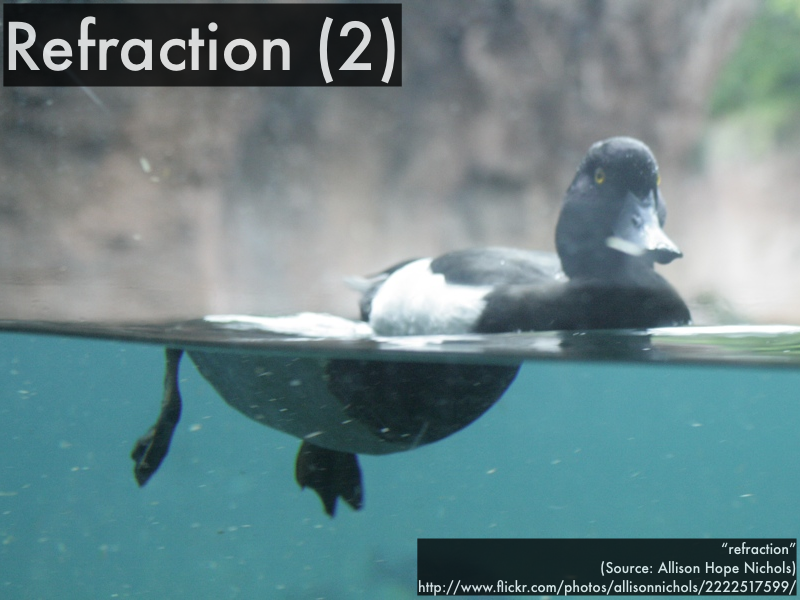 "The difference between refraction (light passing through) and reflection (light bouncing off of). I understood how a higher n value corresponded to a slower movement of light through that particular medium." "That visible light is only a tiny portion of the electromagnetic spectrum, and has some interesting properties as it passes through media. Indices of refraction are a measure of how fast or slow light travels through a media, and can bend when going from one medium to the next." 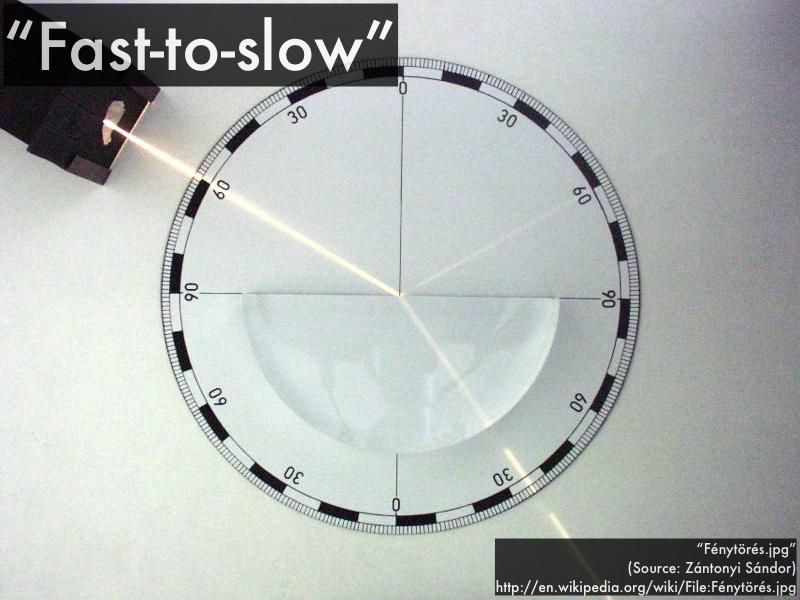 "That a faster light speed means that the refraction index will be lower, and vice versa." "When light waves hit different media, it will speed up or slow down." "The electromagnetic spectrum represents all types of light from low frequency to a high frequency. However, the human eye can only detect a small portion of this spectrum, called visible light." "The reason why light waves become slower is because it was due to the change in the medium. The light waves do not covert to other types of electromagnetic radiation waves as one may assume, they are the same waves with the same frequency, but just at different speed because of the new medium, and because the frequency does not change it is still considered visible light." "Honestly, I am still awaiting my book to come, so I did not read the textbook assigned pages." "I just find it strange that mathematically wavelength equals speed over frequency, but if one were to rearrange the variables it would not necessarily be true, because wavelength is dependent on the other parameters (and not the other way around)." "Remembering how the light is supposed to bend when going from fast-to-slow and vice versa." "I need a little bit of practice regarding the refraction of light, I just need to do a few problems and I'll be solid." 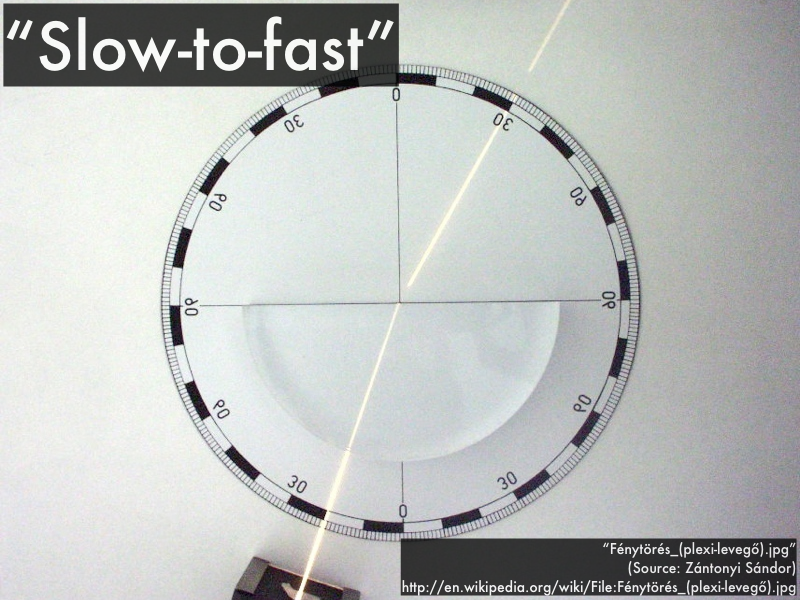 "How to find wavelength and speed based on just knowing the index of refraction." "The hierarchy of the wave parameters. Specifically, I don't understand what it means to be independent of the source or medium." "Refraction, when it comes to the angles and what is meant by a larger angle with a lower index of refraction for a medium and a smaller angle with a higher index refraction for a medium." A ray of light has an incident angle of 60° in air, and a transmitted angle of 36° in plastic. Determine what happens to each of the following parameters as the light passes from air into plastic. For the above example of light incident in air being transmitted into plastic, __________ has the greater index of refraction. A ray of light has an incident angle of 20° in plastic, and a transmitted angle of 29° in air. Determine what happens to each of the following parameters as the light passes from plastic into air. For the above example of light incident in plastic being transmitted into air, __________ has the greater index of refraction. State your preference for denoting the inverse sine operation. "Homework in a flipped class takes place before and after class time, it is used to prepare the information so a student can use class time to really clarify concepts." "The lectures are available before the class starts and directly pertain to the homework. This allows students to read the lecture ahead of time and ask questions in class they may have about homework." "Homework is done more as an in-class activity, where students can benefit more from assistance from the teacher and embedded tutor." "I think it really helps people learn more deeply. If you read about the lesson and can come to class with questions, it can really improve your experience and your professor can help you learn the way you learn. You also have more control over how you're learning new information." "Homework is to go over the lecture before the class and also to check knowledge after the class." "The questions are more complex." "Homework consists of reviewing the lecture so that topics can be discussed in class. The lecture is more hands on with practice problems and group discussion versus just lecture slides." "Some students do better listening, some students do better observing, so the most learning can happen before class or during class. But the bulk of information access happens before the actual lecture." "Most of the learning in the flipped class comes in the classroom. The students learn before class and have a general idea and then once they get to class, they can ask specific questions and no one gets bored or left behind." "'Don't read the book, it's useless.' I get where this student is coming from. My use of it was relatively low compared to my other classes, admittedly. However, I would not call it useless. There were several instances in which I made a connection I would have never made otherwise, about this or that topic, as a result of reading the text." "'Going to the tutor was the only reason I am passing this class!' This is a great piece of advice and one that helped me achieve success last semester." "'Doing the homework and the things before class is useful.' Doing the homework every day. Even though it can become tedious, it makes the rest of the class much less stressful." "'Having the blog handy is also very helpful.' Like in a flipped class it can really help you to come to class with a little bit of knowledge of what you'll be working on." "'What helped me study was doing the example problems given to us before an exam, that way I can find out what I need to work on and study that harder.' I agree with this piece of advice because a big portion of this class is knowing how to attack problems. By doing repititions of the hard problems I'm stuck on, this will prepare me best for the tests." "'It does not help to procrastinate, it is important to keep up with homework and lab, they really help.' I agree with it completely because then you are wasting the professor's and your time if you are not willing to put in the time to do the work." "'Breathe.' I shouldn't allow myself to get so stressed. I just need to stay on top of the online homework and go to tutoring if needed. Not procrastinating will help me avoid getting stressed." "'P-dog's blog and worked-out problems online are probably the most helpful besides just reading the chapters.' Most if not all of the material coverd in class comes from the blog. It's name is very true, boring but important. I really enjoyed what I looked at last semester and sadly it took me a couple weeks to understand the true importance about reading the blog. So yes, read the blog and you will be ready for any questions that you might have." "Looking forward to an enlightening semester P-dog!" "I took Phys 205A in Fall 2015, so it's been a year since I've taken physics but I'm glad to be back in your class again!" "I used to think I couldn't do physics, because I had never taken it and am not really good with the maths, but you made me feel a lot more confident after last semester; thank you for all your hard work P-dog. Im pretty sure I can do well in this class, too."